Get Lange’s RX model—in your flex rating of choice, from 80, 90, or 100—if you love ripping around the resort or you’re an ex-racer who now appreciates comfort. Or opt for Lange’s XT model if you want a walk mode and more backcountry-friendly features. Lange realized a lot of potential customers weren’t fitting into the narrow, precise fit of Lange boots. 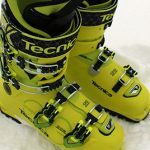 So they made a wider version of some of their boots for skiers with “flipper feet,” but they still have the same high-performance characteristics of a Lange. Now, you can get the RX 100 women’s boot in a narrow or wide model. There’s also a more backcountry-friendly version called the XT, which has a walk mode and replaceable toe and heelpieces. On the hill, this boot charged like a race boot without feeling nearly as constricting or uncomfortable as race boots usually do. The RX shell is designed to give you good power and balance and improve efficiency even on fat, rockered skis. You’ll be happy with these boots no matter what kind of terrain or snow conditions you’re dealt with. Lange’s Control Fit liners can be custom heat molded for a flawless fit. The liner shapes to your feet for a sensitive and responsive feel. There’s no fluff to this boot—no fancy, girly features like fuzzy liners or easy-clamp buckles. In other words, you’re not going to be pampered by this boot.